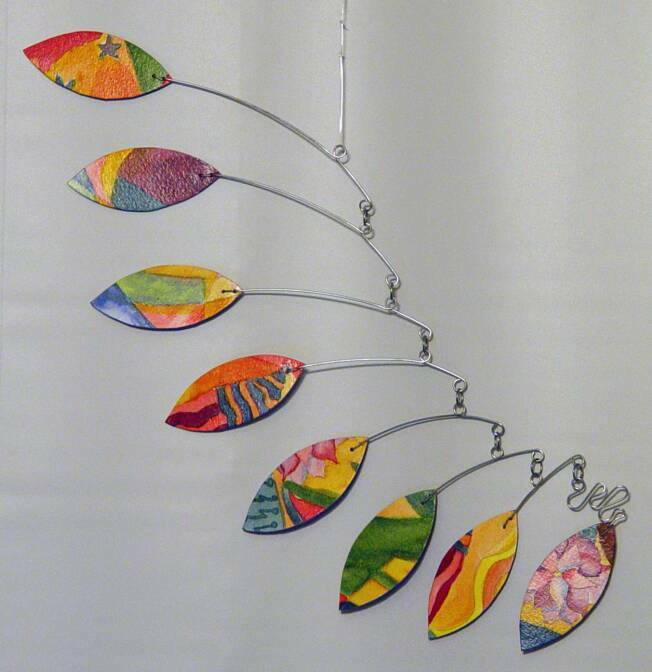 I delight in seeing colorful shapes aloft and so I create kinetic mobiles with watercolor paintings permanently adhered to aluminum. It is a fairly new medium and my research tells me that it is a medium with limitless possibilities. I am a former fabric artisan who created art kites and art banners for almost 15 years. During this time I won many awards for this work but my days in the sun are over. I was also fortunate enough to learn wire and metal jewelry work as a teen and have continued this work off and on for over 30 years. This wirework is what led me to the discovery of the kinetic mobile. 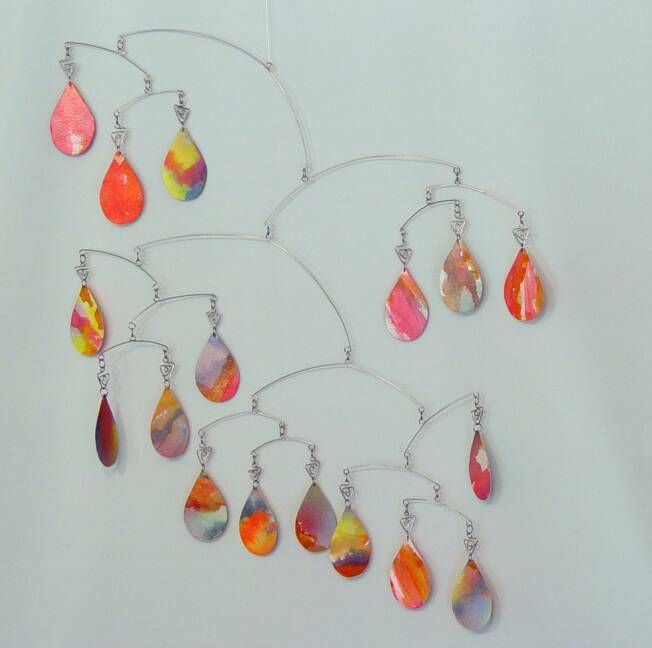 After creating some pendants for a customer she commented that it was kind of kinetic. After some research on kinetics, I discovered the work of Alexander Calder. How would I know that day and my customer’s comment would change my life! Today, my mobiles float on the air currents of a room as if by magic and are considered artistic sculptures. When a single component of one of my mobile catches the current of air in a room, it creates a chain reaction, kinetics, making other components on the mobile move in succession. After studying Calder’s work, I set out to develop my own unique style. 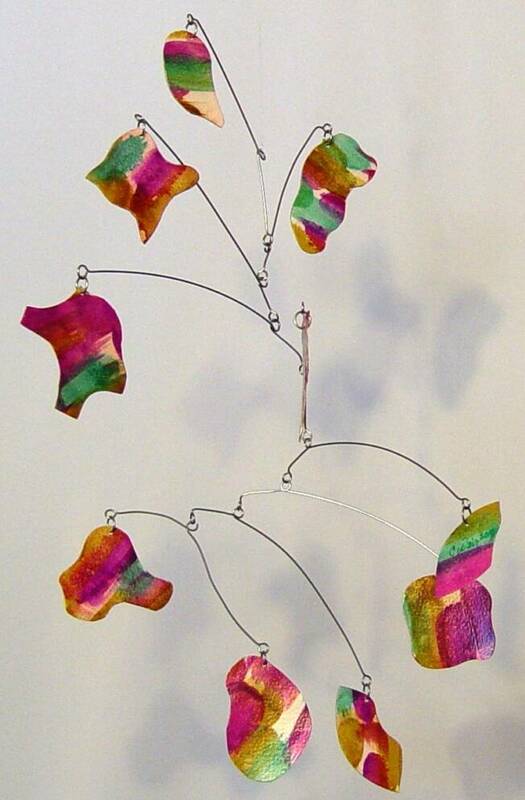 I came up with the idea to create original watercolor paintings and permanently adhere them to aluminum after finding that all of the examples of Calder and other mobile makers work lacked the beauty of multiple colors. After adhering the watercolor to aluminum, I seal the component and attach it to wire where I carefully balance the object. It took quite a bit of trial and error but I have finally created kinetic mobile sculptures that are fresh and unique and perfectly balanced. The watercolor is what makes my work unique. No two mobiles are exactly the same. I delight in seeing colorful shapes aloft daily and hope you get the chance to experience the same calm relaxing joy.